It may sound unfathomable but kids sometimes get antsy after several days hanging by the pool at a beach resort. 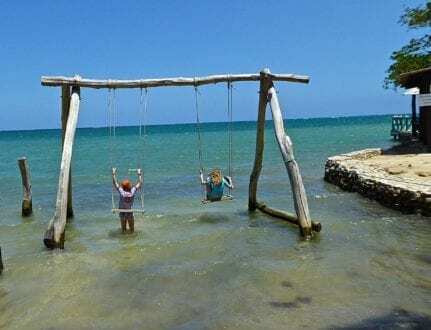 When this happened during a recent stay in Montego Bay, Jamaica, we turned to Chukka Caribbean Tours to inject a little family-friendly adventure into our trip. A family-owned business, the inspiration for Chukka Tours sprang from its founder’s passion for polo. Apparently, polo was big in Jamaica in the 1980’s when the family’s patriarch, Danny Melville, used to host polo matches at his polo field in Ocho Rios. 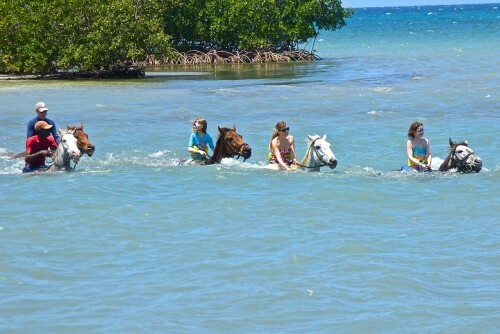 On Sundays, to help the horses relax, the polo players and the Melville children took the horses swimming in the waters of Mammee Bay. Danny eventually opened a polo and equestrian center for locals in 1983 and he decided to complement it with riding opportunities for tourists, and thus the first Horseback Ride ‘N’ Swim was born—thirty years later, it’s still their signature tour. This tour begins with an hour-long ride on dry land through the hilly countryside in Sandy Bay. There is a guide leader but there are also group leaders to help with inexperienced riders. 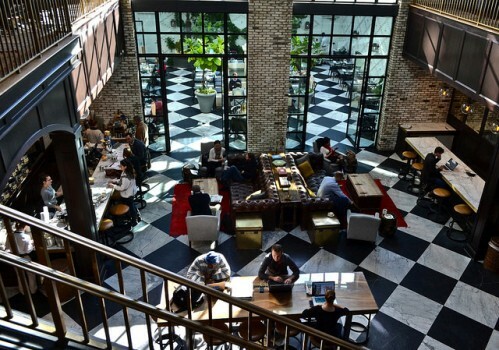 Expect to enjoy sweeping views of the area and a few ruins from 18th century plantation days. The guides were friendly and entertaining as they taught us about the indigenous plants and trees we were seeing and a history of the area. The swim portion of the experience is much shorter—about 15 minutes. After returning from the long hot walk the handlers change the horse’s saddles to specialized water models. 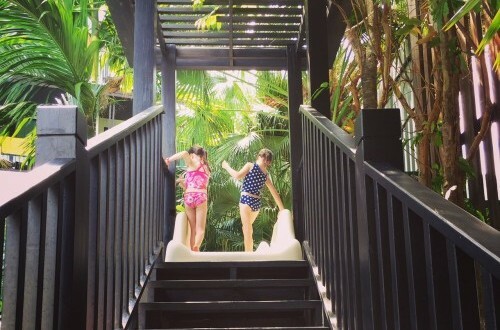 This also gives visitors a chance to change into swim suits, grab a snack and a drink, and relax in the hammocks or the kids can play on the swings as the guides takes smaller groups to swim with the horses. 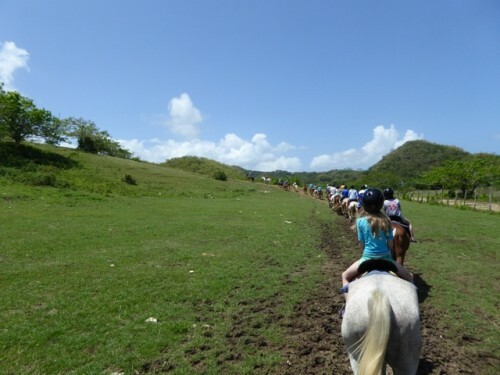 Overall, this excursion has enough adventure for the kids, not too taxing for the grownups and is especially fun for those who love horses. If you want a more adventurous break from poolside relaxing try one of their other adventure tours like jungle river tubing, zip lining, kayaking safari or even get a zip, tube and slide combo. 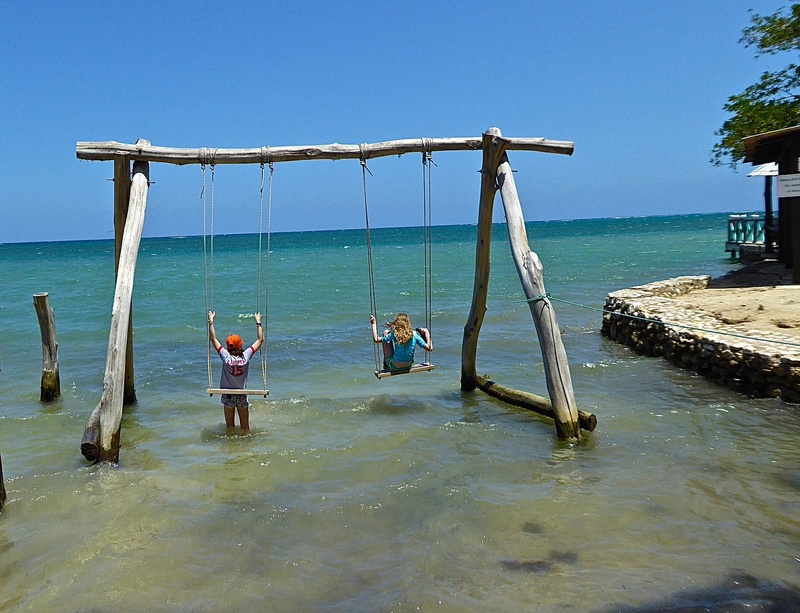 In Negril, they have a a Thrill Seekers Pass that has it all. You can tube, zip and slide but there is also a horse and carriage ride through a local village to have a rum tasting, shop for locally made gifts. Next time. Chukka also has outposts in Ocho Rios, Jamaica, Dominican Republic, Belize and Turks & Caicos, so your family need never get bored in the Caribbean. En route the driver, Herby, (or another driver) entertains while giving practical information about Montego Bay. You will have time to change before the swim portion of the tour so wear comfortable shorts or pants for the hour long ride. There are no stirrups for the swim so you don’t need water shoes.